I wasn’t going to read Seabiscuit, by Laura Hillenbrand. Something about the glossiness of the hardback edition, the size of it, perhaps its sheer presence, put me off. I never heard of it before it was made into a movie, and I tend not to read books that I find out about when they are made into movies. I distrust popular taste, especially in the form of a movie being made from a book. If it is such a good book, why didn’t I find it in the library or bookstore and read it before it became popular? Can it really be such a good book if I didn’t read a review of it or see it somewhere before it was popular? 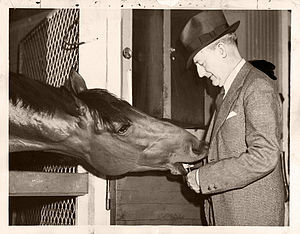 But it is possible to be wrong, and I am here to tell you that I was wrong about Seabiscuit. It really is an incredibly good book. I found the paperback edition at the library book sale for 50 cents, and it seemed silly to pass up what everyone said was a very good book at that price. At that price, I figure, I’m not out much if I don’t like it. And I opened the book, read a few pages, and was hooked. Ms. Hillenbrand spins sympathy for her characters almost out of thin air, fills the pages with tons of historical detail, and carries the gripping narrative along all the way. Who would think that an account of the automobile industry in San Francisco in the early years of the 20th century is page-turning material? Actually, my only disappointment with the book is that after making the reader care deeply about Charles Howard, owner of Seabiscuit, and his business in the first part of the book, nothing more is heard about any of that, except for Mr. Howard’s attitude towards Seabiscuit, after the other characters are introduced and we begin to follow Seabiscuit’s career. I can see that a definite editorial decision had to be made, and to talk about the auto industry any more would have been a distraction, but I am still disappointed. I was sorry to reach the end of Seabiscuit’s career, and then the end of the book as we found out what happened to all the characters later, but I enjoyed every minute of reading it.